My little sister lives in a different world than I did. She lives in a different world than I did. One with her own bedroom and court-ordered visitation and Christmas presents from a kind stepmother. She has never been homeschooled. She does not remember a time when our family didn’t celebrate birthdays, or was too poor to buy a piñata, or was too “modest” for her favorite summer clothes to be allowed. 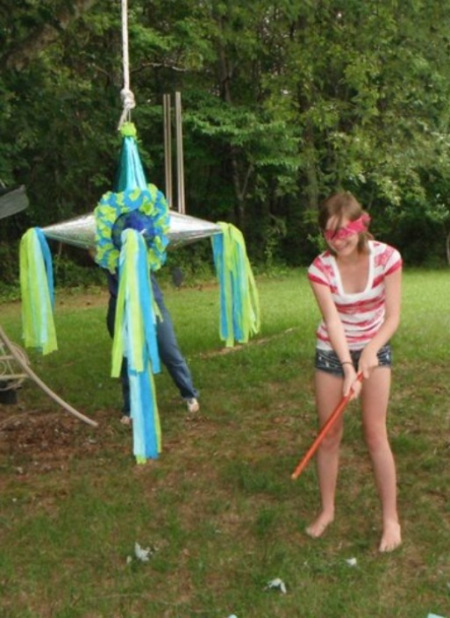 She could be using any stick to hit this piñata but she isn’t. She’s using the “red stick,” the most infamous spanking implement our family had. As far as I know, none of the younger siblings attending this party were ever touched by the red stick and I imagine just a few had been threatened, but the grim knowledge of what it was used for had been passed down. Then it became something totally new. An object of fear. It stayed hanging on a nail or propped in a corner in my Dad’s bedroom or office for years except when it was picked up and used to threaten or to leave welts. Mom catches one sister padding her underwear with toilet paper in anticipation of a beating. After that, it’s bare bottomed. “Pull down your pants. Bend over.” Red stick. Sitting in the “punish chair” corner ’til sundown, hearing the car crunch gravel in the driveway, shaking, hands going cold. Red stick. “But I don’t want to try and eat a pickled pig lip out of that jar, Dad. It looks just like apig’s lip.” “If you don’t try it, you’ll get the red stick. You’d better eat it and like it.” Tears. Gagging. Spitting chunks of pickled pork into the sink. Red stick. 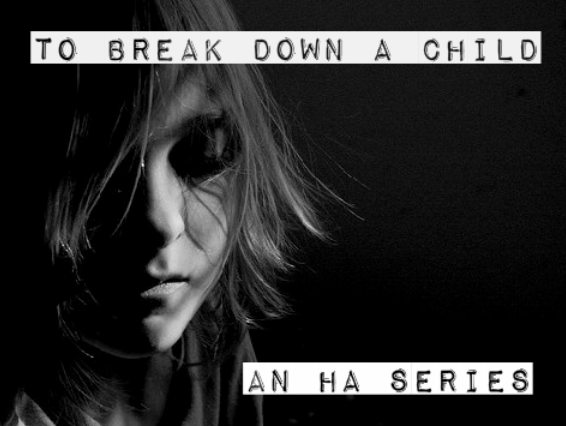 Pain, shame, anger, fear. Yelling. Red stick. Running, cursing, slipping, falling, being caught and dragged. Red stick. Grabbing the red stick tightly, just as tall, if not quite as strong as the woman holding it. “Let go,” Mom says. It strikes me that this photo is the only known picture of the red stick. The only official proof of it ever existing or being used is in a pleasant scenario. As it happens, the red stick finally died that happy day, broke while connecting with the piñata and ended up in the garbage. A sibling sent me a message informing me that the red stick had met its end and that when Dad was out of range, they had celebrated its demise. I was glad, too: glad it was gone and that it did not die the way I had always imagined it would — splintering into pieces over a child’s behind. It would never be used to hurt anyone again. It had broken being used the only way it should have ever been used, in the original spirit it had once had — innocently in child’s play. It’s great knowing that the red stick met its end, that you and your kin achieved a small, comforting victory over the parents who hurt you. each of these stories is just humbling to me, and oddly relieving. I used to put on all my pairs of underwear and a few skirts when I knew mom was going to spank me. She discovered once when I wasn’t crying as much as usual, and after that, yeah, bare bottom. We didn’t have an infamous red stick…just a series of wooden cutting boards, paint stirring sticks, belts, and small pieces of lumber. My siblings and I used to sneak them out of the house and burn them in the burn barrel. Of course, finding out that these objects were missing only made mom transition to spanking more, and keeping a belt on hand. She used to keep a paint stir stick stuck in the couch next to her Bible. Both were used to bludgeon us, although the latter was used metaphorically it was no less painful. To this day, I absolutely hate those little wooden paddles with the rubber ball attached. And I don’t own a single wooden spoon, and I threw away the similarly shaped plastic one that sat unused for a couple of years in my kitchen drawer after it was gifted to me. When my husband held it up in the air and asked me “Should we pack this or donate it?” I have to admit that something tightened in my gut just a little and I looked away as fast as I could manage and said “no, throw it away”. The worst thing though is the look on a persons face when they tell me that I have not met their expectations. It can be anyone. It doesn’t have to be something important either. The intense rage that boils up inside me when anyone looks at me and says the words “that’s not good enough” is scary and overwhelming. Fight or Flight mode switches on like a lightswitch and I usually run because I know that I never, ever, ever want to find myself being the one holding the stick.